1/ Ten Tips About Buying a New Shed, Summerhouse in respect of what questions to ask, which are best and conclusion about what to do. 2/ Ten Tips About Garden Building Cladding in respect of different types, which are best and conclusion to save buying the wrong building. 3/ Ten Tips To Consider When Buying Garden Shed Building in respect of subjects not really thought about. 4/ Tips To Consider About Garden Buildings roofs in respect of subjects not really thought about. To try to help you make the right decision this web site will try to highlight what you should look out for and what you should avoid and – as importantly WHY. Whilst we all want the cheapest price for our garden shed, timber workshop, summer house or log cabin it’s vitally important that you ensure you buy a building which will fill all your needs and, very importantly, will stand the test of time. This is why you need to do a little homework beforehand. Yes, I know, we were all not keen on doing ‘homework’ but believe me this homework is vital to ensure you are happy when your new building is delivered. 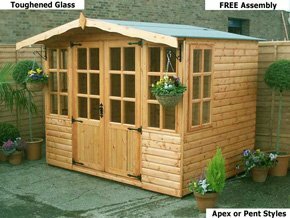 The garden shed is what most gardens need and these come in a large number of different sizes, shapes, designs as qualities. To ensure you buy the correct one to suit your needs you need to know about the type of timber cladding used, how thick the framing is, whether it has a proper floor and roof made from timber and not cheap man-made materials – such as OSB board. Also the height, how good is the shed door and the glass used. The type of treatment is quite important as well and do all the shed panels come in complete sections. 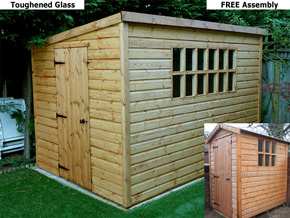 Will your new garden shed be delivered and dumped in your garden or will it be erected. Will you be charged extra for delivery and assembly. For answers to all these questions and another important aspect of buying a garden shed take a look on these pages. 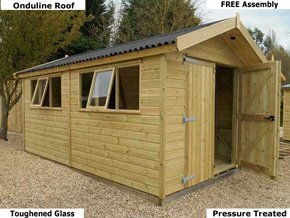 Timber workshops for your garden need to be stronger than a shed just used for storage so it’s crucial that the timber used on these buildings is of the right dimensions to ensure your new building will stand up to day to day use. With many sizes, designs and qualities always check what you are buying. How thick is the cladding (plans of wood on the wall), how strong is the framing, is the floor or roof made from chipboard or OSB board. The height is even more important on a timber workshop because you are likely to be working inside it. Will your new building just be delivered and left for you to build or will it be erected. The questions to check upon before buying garden workshops can be found by taking a look on these pages. Summer Houses for your garden are designed for relaxing – or should be – so you need to ensure that they have been made for this purpose and that no corners have been cut in materials used or in the design of the summerhouse. By being made in the correct way you can be sure that your family and friends will be able to enjoy time together in your new summer building. With such a large array of buildings in many designs and sizes, you need to be very careful to ensure you buy a summerhouse to suit your needs. You need to check on the thickness of the timber & framing, the height of the building, the floor & roof and glass used. Will your new summerhouse be erected of will you need to do this. For answers to all these questions and another important aspect of buying a summer building take a look on these pages. 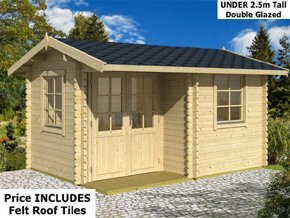 Log cabins are primarily used for relaxing in for can be used for garden offices. Again the key to these buildings is the quality and type of materials used. Very important is the thickness as some “log cabins” are made using 19mm timber – ludicrous! So the main thing is to check and ask questions so you are sure you will get what you think you are getting. Ensure your log cabin will be ‘fit for purpose’ as many log cabins debatably are not. So check the thickness, height, the type of furniture used and glass.